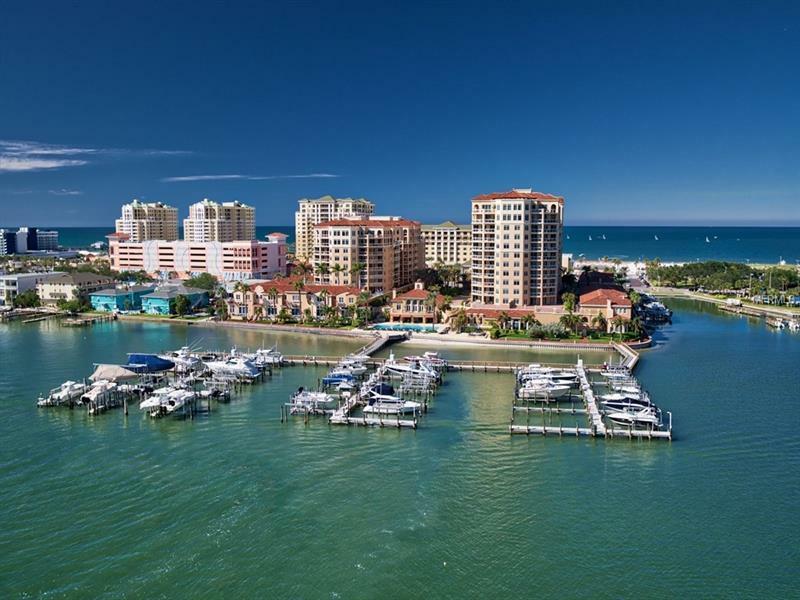 Live in one of the best communities in Clearwater Beach. Experience luxury and convenience behind the gate of Belle Harbor. Enjoy the sunset and the sunrise from your spacious balcony overlooking the Marina and views of the Gulf. The fluffy sand beach of Clearwater is just across the street. This wonderful fully furnished home is 2 bedrooms and 2 baths with an additional den that can be used as a third bedroom or office. Large light and bright open kitchen with Bosche appliances, decorator tile backsplash and an extra bonus of a wine refrigerator. All of the bedrooms have wonderful views of the water. Large Master Bath has dual vanities. Full Size washer and dryer in the laundry room. No detail has been overlooked. Enjoy the serenity this condo community affords. But, if great restaurants and night life are what you want, all of that is a short walk from the front security gates. Luxury and casual dining is just across the street on the beach. Belle Harbor has all the amenities you could ever need. Wonderful pool and spa with covered and uncovered areas to enjoy the views. Grills, dual fireplaces and lounge area near the pool for entertaining. Storage area for bikes. Great Clubhouse for gatherings or a place to get away from it all. Come and enjoy all that Clearwater Beach has including theatre, concerts, movies on the green and festivals. Life is great at Belle Harbor.